We went into Coire an Lochain on Friday as it seemed to be the last reliably good weather day! 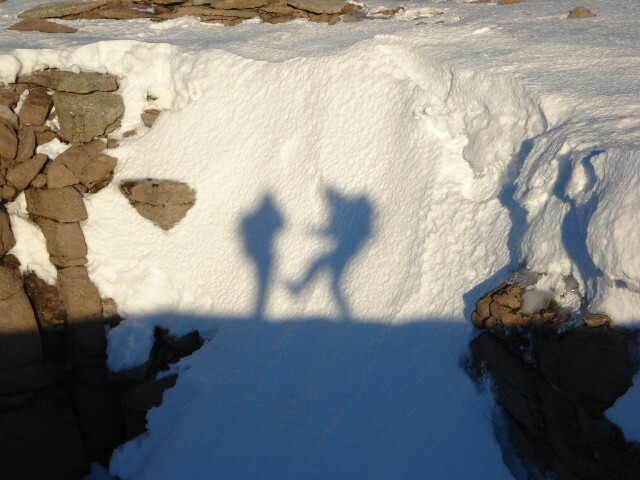 Sunshine and blue skies again and fun shadow folk to be seen at the top of the Vent! Ron and I climbed Ventilator which was rocky lower down but had a lovely snow arete at the top right hand-side of the Vent's exit. 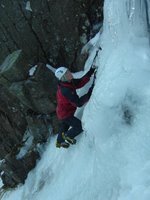 We walked across the plateau and down the Goat Track to have a look at the routes in Coire an t-Sneachda where we found some thick ice which gave a fun short climb. After we wandered around a bit further and as there was still lots of daylight left, we finished off the day by soloing up Central Gully and walking back down by the light of the almost full moon.